In an innocent remark at a Churchill conference long ago, I repeated the long-running assertion that Sir Winston’s father died of syphilis. The story, after all, was accepted by his son Winston, and most of the family. But not all! Celia Sandys, one of his grand-daughters, immediately challenged me: “Are you quite sure?” Well, no. Thus began my search for the truth about Lord Randolph’s final illness. A medical biographer is devoted to matching a medical diagnosis to the signs and symptoms of a medical condition. Establishing real evidence is difficult, especially if the subject is long deceased. It is sometimes helpful to consider the subject’s vocational performance. This is certainly possible with world statesmen, who leave broad records. But undue speculation is rightly criticized by medical experts and historians. Mr. Churchill was convinced that Lord Randolph never suffered from syphilis. The rumor, he said, began with a disaffected literary agent, Frank Harris, who nursed a grudge against his Uncle Winston. Harris included the charge in a scurrilous 1922 memoir, My Life & Loves, and somehow it became accepted writ. Intrigued, I set about finding what I could from secondary sources, and the medical records of Dr. Thomas Buzzard, the neuro-syphylologist who cared for Randolph alongside the family doctor, Dr. Robson Roose. Soon after I chatted about my quest with an ear, nose and throat (ENT) surgical consultant, Dr. Bill Lund, who had briefly been my superviser at Middlesex Hospital and Medical School in 1968. He was now a surgical consultant at Radcliffe Hospital, Oxford and living in Woodstock, Lord Randolph’s old parliamentary constituency. Dr. Lund said that a Radcliffe colleague, Dr. Teddy Farquhar, one of Buzzard’s grandchildren, might know something about his grandfather’s medical papers. Indeed he did. His older sister Margaret, now in a Woodstock nursing home, had Dr. Buzzard’s papers with her in a large trunk. She and Teddy authorized me to review them. They proved to be a trove of medical information on Lord Randolph Churchill and Buzzard’s other patients. I was not allowed to make photocopies, and so took copious notes. I understand that they were eventually archived at the Royal College of Physicians, London. I next searched medical literature on the prevalence, incidence and treatment of syphilis in the United Kingdom during the 19th century. The spirochete for syphilis was not discovered until 1905, and the blood test not devised until a few years later. So it seemed that syphilis, with its protean symptoms and signs, could have been over-diagnosed in earlier years. A distinguished 19th century physician, Sir William Osler, wrote in his Textbook of Medicine: “He who knows syphilis knows all of medicine.” In Osler’s time, diagnosis primarily depended on a good history of symptoms and observed manifestations of the supposed disease process. There were no blood tests, no diagnostic radiology, no sophisticated diagnostic techniques. Neurologic diagnoses were in their infancy. There were few clear differentiations between conditions like epilepsy, multiple sclerosis, amyotrophic lateral sclerosis (Lou Gehrig’s disease), chronic alcoholism, brain tumors, Parkinson’s Disease, or progressive vascular dementia complicated by high blood pressure. Similarly, specific psychiatric diagnoses, such as neurosis versus psychosis had just begun. The differences between those symptoms attributable to a neurological diagnosis in contrast to a purely mental (behavioral) impairment were just beginning to be unscrambled. Lord Randolph’s symptoms and observed behavioral changes mostly occurred in the last five years of his life. My immediate problem was to sort out whether there was just one or several diagnoses. Like many of the aristocracy at that time, he certainly was often “in his cups.” He was also for many years a chain smoker of strong Turkish cigarettes. 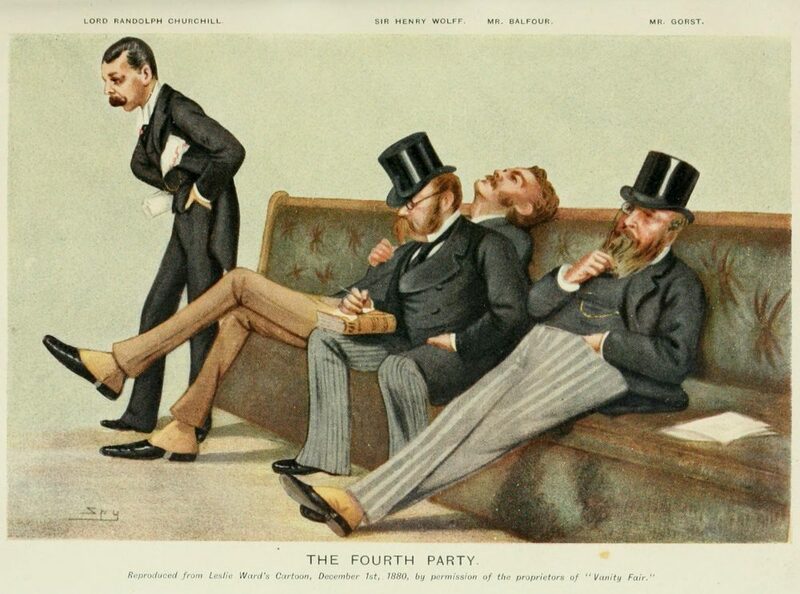 During one of his last speeches in the House of Commons, his friend Lord Rosebery noted, he proceeded with hesitation, slurring his words… “the chief mourner at his own protracted funeral,” Rosebery later wrote. But was this a manifestation of syphilis, or alcoholic indulgence? I wondered. Lord Randolph’s health had been precarious since his youth. He smoked so much as to “burn his tongue.” Friends and physicians advised him to quit smoking and moderate his drinking. For two years prior to his death in January 1895, he intermittently suffered numb and cold hands and feet, somewhat relieved by immersing them in hot water. This is totally consistent with Raynaud syndrome, commonly found in excessive smokers. He was a very hard worker, with a frenetic energy, “of a temper that gallops till it falls” as his son described him. Periods of intense activity led to exhaustion, followed by bouts of fatigue and melancholia. These observations, combined with his mood swings, incline one towards a diagnosis of a manic-depressive condition. Lord Randolph holds forth: “His wit, his sarcasm, his piercing personalities, his elaborate irony, and his effective delivery, gave astonishing popularity to his speeches.” Caricature by “Spy” (Leslie Ward) in Vanity Fair, 1 December 1880 depicts “The Fourth Party” of Tory Democrats: Lord Randolph, Sir Henry Drummond Wolff, Arthur Balfour, Sir John Gorst. In 1890 Randolph experienced palpitations associated with exhaustion. The family physician, Dr. Roose, prescribed belladonna, laudanum and digitalis. The following year, he experienced an episode of severe confusion, which suggests an acute episode of high blood pressure. Around the same time, he began to have speaking difficulties, associated with hearing and balance problems. Besides the now intermittent numbness in his hands and feet Randolph had complained of dizziness. Much later, in mid-1893, however, Dr. Roose told a distraught Lady Randolph, that her husband’s heart condition was nonetheless cured. A cardinal feature of advanced syphilis is a dementia (confusion) and muddled thought processes. While Lord Randolph had some difficulty articulating words (expressive aphasia) he had virtually no problem with writing down his thoughts. Muddled thoughts, memory lapses and profound confusion—all features of advanced syphilis—were absent from Randolph’s writings almost until his death. He wrote more lengthily, and his script became shaky, but it was never unintelligible. Until the last, when he was in a coma, his writings were rational. They include a cogent, thoughtful letter to Winston while on his world tour in August 1894. After further study of Lord Randolph’s symptoms and rapid deterioration, I concluded as follows: While the diagnosis of advanced syphilis is possible, the cause of his condition was far likelier to have been a brain tumor. About a decade ago a Lady Randolph biographer asked a neurologist from Kings College Medical School to review Dr. Buzzard’s medical records. He told me that all they revealed was that Randolph had a chronic progressive neuro-degenerative disease of the brain. He did not specifically rule out syphilis, but considered that it unlikely. Jennie, Winston and Jack, he observed, never suffered syphilis. There has been speculation that Jack was not Randolph’s biological son but this proved nothing more than unsubstantiated gossip. In any case, Jack was born in 1880, two years before Randolph’s first symptoms appeared. If the cause of death was a brain tumor, why did it take Lord Randolph so long to die? In fact, his symptoms were not severe enough to call in Dr. Thomas Buzzard until 1893, two years before his death. Hard and fast conclusions, as noted, are elusive. Given the available evidence and much research, it seems highly unlikely that Lord Randolph Churchill died from advanced syphilis. The more likely cause was a tumor deep on the left side of his brain. Brain tumors are variable, and range from relatively benign to highly malignant. Depending on which type of tumor cell and the accompanying relatively slow growth of the tumor in a particularly dangerous part of the brain, the progressive changes in his speech and balance are explainable. There will always be that nagging belief that Randolph died of syphilis. But a full examination of his medical problems, such as are available, and the relatively primitive medicine practiced in his lifetime, lead us to the conclusion that a diagnosis of syphilis is unwarranted. Does it matter? Only to prevent the routine slur in modern denunciations of Winston Churchill that his father died of a sexually-transmitted disease. 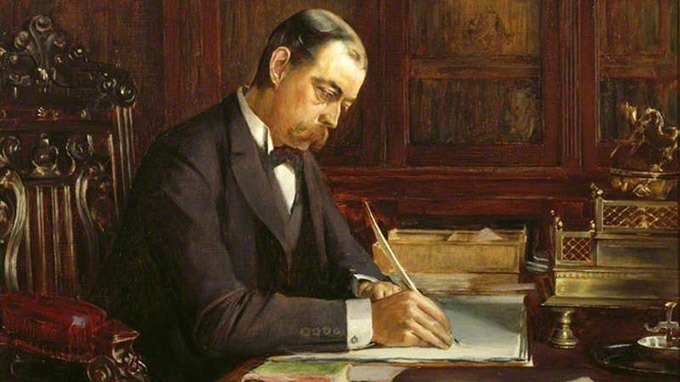 Sir Winston’s daughter often admonished us: “Keep the memory green and the record accurate.” With her wishes in mind, this medical biographer concludes that there is enough medical information to consider syphilis a most unlikely cause of Lord Randolph’s death. Dr. Mather is archivist-historian of the Churchill Society of Tennessee, and has spent many years as a medical biographer of Winston Churchill and other notable statesmen.